There are so many wonderful books to read at the beginning of the school year. 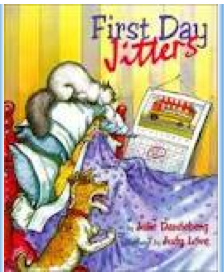 I chose First Day Jitters, by Julie Danneberg, for this blog hop/linky party. Every teacher gets classroom jitters. The night before school starts, I toss and turn and think about all those last minute details I need to take care of before the students arrive. However, when the alarm goes off, I really don't want to get out of bed. My stomach is usually full of butterflies. I find it hard to choke down my breakfast, but I know just having coffee won't be enough. At school I rush about while waiting for the bell to ring. My butterflies fly away as I open the door, to those darling little ones all dressed in the first day of school outfits, with backpacks as big as they are. I love to read this book to my students on the first day of school. With its surprise ending, the students really get a good chuckle. It helps spark the conversation about what they might have been afraid to come to school. After students have had an opportunity to share what worried them about coming to school, We draw a self portrait of our first day.